Meet the people who tend to our Tenderstem® as they explain what makes our mini trees so darn delicious. Meet Andrew and Caroline Green—a husband and wife team to be reckoned with in the world of Tenderstem® growing. Whether it’s cultivating a million Tenderstem® plants, or delivering the earliest UK crop, they’ve been there and got the T-shirt. With over a million Tenderstem® plants grown in 20 hectares of their land, it contributes about 20% of their business turnover. And they’re not stopping there. They have previously used their innovative and secret methods to win the accolade of delivering the first English Tenderstem® to supermarket shelves. 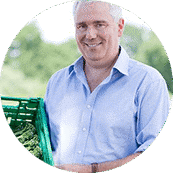 George Read and his brother Vernon are totally passionate about producing the best quality crops at Staples Vegetables, growing a range of crops from cauliflower to courgettes, peas to potatoes – and one of George’s favourites, Tenderstem®. Over time, they’ve taken the 350 acres they started out with and increased it to over 10,000. Twenty years ago Nathan Dellicott was sitting, cold and miserable on a harvester in Lincolnshire, harvesting sprouts when he decided enough was enough, and it was time for a change. So he moved to Barfoots in West Sussex where he took a position as farm manager. One of the things he loved about his new job was an unusual crop they were growing: Tenderstem®. There was no manual for growing it, no set way of doing things, so Nathan was happy to be involved. It wasn’t easy though. A technologist from one of the big supermarket chains came to visit and told Nathan that Tenderstem® couldn’t be grown in the UK. But it became a bit of a personal mission for Nathan to prove him wrong. He had to use all of his experience to overcome the challenges he faced, but he remembers those early days at Barfoots as a lot of fun. And, as it happens, West Sussex, where Barfoots is located, is actually one of the best locations for growing Tenderstem®. The salt in the air is something Nathan thinks makes Tenderstem® from Barfoots so tasty. In this video Matt Gedney, talks about the labour of love it is to grow and harvest Tenderstem®, and food writer and stylist, Genevieve Taylor, demonstrates its incredible versatility in the kitchen.